Little yellow sticky notes like the familiar Post-it Notes are easily one of the best methods every invented for keeping track of reminders and random bits of information. They're so popular it didn't take long for sticky notes to start showing up in virtual form on PCs. In fact, when Microsoft added "Sticky Notes" to Windows Vista the company was only catching up to what users had been doing with third-party programs for years. Just like their physical world counterparts, sticky notes in Windows are a useful way for quickly writing yourself a reminder or jotting down a quick fact. Even better, they're about as useful as real paper sticky notes, and in Windows 10 they've arguably surpassed what those little scribble pads can do. If you're still using Windows Vista, you'll find sticky notes as a gadget in the Windows sidebar. Open the sidebar by going to Start > All programs > Accessories > Windows Sidebar. Once the sidebar is open, right-click and select Add Gadgets and select Notes. Now you're ready to go with "sticky notes" in Vista. You can either keep them in the sidebar or drag notes onto the regular desktop. At the bottom of the screen will be a window that says Search programs and files." Place your cursor into that window and type Sticky Notes. The Sticky Notes program appears at the top of the popup window. Click the name of the program to open it. Once open, a sticky note appears on your screen. At that point, you can just start typing. To add a new note, click the + (plus sign) in the top left corner; it will add a new note, without deleting or overwriting the previous note. To delete a note, click the X in the top right corner. For those with Windows 7 tablet PCs (ones on which you can draw with a stylus), Sticky Notes are even better. You can jot down your information just by writing with your stylus. Sticky Notes also last over reboots. So if you type out a note to yourself to, say, buy donuts for the afternoon staff meeting, that note will still be there when you power up your computer the next day. 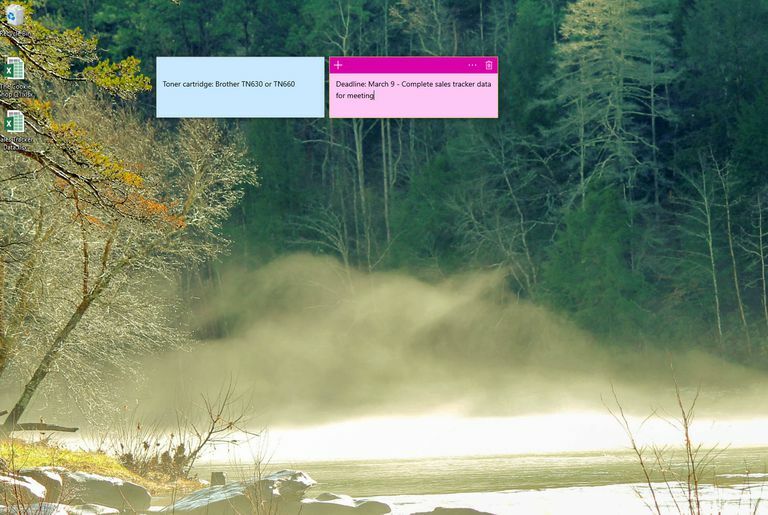 If you find yourself using Sticky Notes a lot you might want to add it to the taskbar for easy access. The taskbar is the bar at the very bottom of your screen and contains the Start button and other frequently-accessed applications. Right-click the Sticky Notes icon. This will bring up a menu of actions you can take called a context menu. This will add the Sticky Notes icon to the taskbar, giving you instant access to your notes anytime. If yellow just isn't your color, you can also change the note color by hovering your mouse over a note, right-clicking it, and selecting a different color from the context menu. Windows 7 offers six different colors including blue, green, pink, purple, white, and the aforementioned yellow. Sticky Notes remained pretty much the same in Windows 8, but then Microsoft went and made Sticky Notes a far more powerful application in the Windows 10 Anniversary Update. First, Microsoft killed off the traditional desktop program and replaced it with a built-in Windows Store app. That actually didn't change Sticky Notes too much, but they do look much cleaner and simpler now. The real power in Sticky Notes in the Windows 10 Anniversary Update is that Microsoft added Cortana and Bing integration to help you create reminders for the personal digital assistant built into the operating system. You can, for example, type or write with a stylus, Remind me to renew my gym membership today at noon. After a few seconds, the word noon will turn blue as if it were a link to a web page. Click on the link and an Add Reminder button appears at the bottom of the note. Click the add reminder button and you'll be able to set-up a reminder in Cortana. The process is admittedly a bit cumbersome but if you like to use Sticky Notes, and you're a Cortana fan, this is a great combination. The key thing to remember is that you have to write down a specific date (such as October 10) or a specific time (such as noon or 9 p.m.) to trigger the Cortana integration in Sticky Notes.